Davenport City Hall is located at 226 West 4th Street, Davenport, IA 52801; phone: 563-326-7763. Photo: The "Treaty House" was built at the exact location Chief Keokuk and General Winfield Scott signed a treaty to end the Black Hawk War in 1832. Location of the house at this point was part of the terms of the treaty. 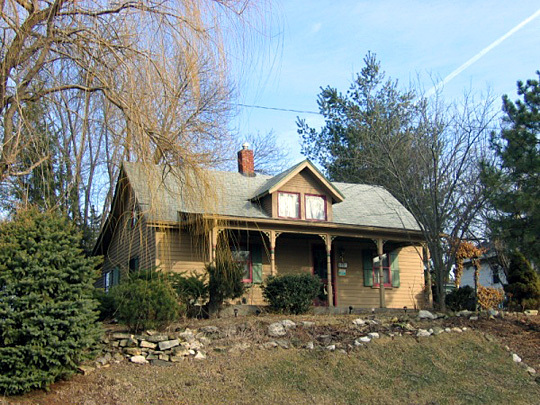 The house has since been moved from its original location. The house was completed in 1833 by Antoine LeClaire. Listed on the National Register of Historic Places in 1983. Photographed by User:Ctjf83 (own work), 2008, [cc-by-3.0 (creativecommons.org/licenses/by/3.0)], via Wikimedia Commons, accessed August, 2014. The Davenport Multiple Resource Area was listed on the National Register of Historic Places in 1983. Portions of the text below were adapted from a copy of the original nomination document. Adaptation copyright © 2010, The Gombach Group. Davenport was platted in 1836, as a rectangle six blocks long and 6-1/2 blocks wide, on a long, narrow flood plain ringed on west, north and east by hills rising to steep bluffs, through which streams and ravines cut in a southeasterly direction. This original plat, with Vine as the westernmost street and Ripley the eastern most, was soon expanded, primarily to the east and north, through subdivision of the Reserve owned by one of the city's founders, Antoine LeClaire. "In the 1850's, additional plats extended the city's western boundaries some 14 blocks to Telegraph Road, which ran along the base of the western bluffs. By the end of the 19th century, the floodplain was fully and intensively developed, and the city had long since expanded well north, to about 16th Street, and east to Bridge Street on the far edge of LeClaire's Reserve. Davenport's original and subsequent plats followed the common gridiron pattern, oriented to the compass without regard for topography. As a result, streets in the 19th century city run strictly north-south and east-west, exceptions being River Drive, Telegraph Road, and some streets in the south-central portion of LeClaire's Reserve where hills and ravines at last triumphed over rectilinearity. Today, the major east-west streets, running the full length of the flood plain, are River Drive, Second, Third and Fourth, with railroad track, first built in the mid-1850's, along Fifth Street at the base of the bluffs. Although Ripley was to have been the major north-south street, early commercial expansion of the city to the east resulted in the development of Main and Brady Streets, and to a more limited extent Harrison Street, as principal north-south arteries. Brady Street is the division between the city's west and east sides,'as reflected in the street numbering system. The architectural landscape of "old" Davenport reflects the fact that plats subsequent to the original were made on the whole rather unsystematically, as was the resulting development. The 19th century combination of "leapfrogging" plats beyond unplatted areas, coupled with periodic infill of later construction in earlier plats, has meant that architecturally homogeneous neighborhoods displaying a single time or style are almost nonexistent, except in the extreme northern reaches of the survey area (and are numerous beyond these points). Where cohesion exists, it is primarily limited to individual blocks. For more than a century, Davenport has been one of Iowa's largest cities. Its growth has been solidly based on a combination of transportation, industry and commerce, each evolving over time to meet new market demands and advances in transportation and manufacturing technology. Happily, decades of growth, even to the present day, have not obliterated Davenport's heritage. The richness of its past is still very evident in the number and variety of its significant buildings and structures. In 1832 the U.S. government concluded a treaty with the Sauk and Mesquakie tribes that opened to white settlement a 50-mile-wide strip of land on the west side of the Mississippi, between the Yellow River on the north and the Des Moines River on the south. One of the beneficiaries of the Black Hawk Treaty was Antoine LeClaire, a French-Indian trader who acted as interpreter during the treaty negotiations. For his services, LeClaire was granted two tracts of land, one at each end of the Mississippi's Upper Rapids. When land was officially available for purchase, LeClaire acquired additional land adjacent to his lower tract. Three years later, in 1836, LeClaire was one of eight men, among them Indian Agent George Davenport, who laid out the first plat of the future city of Davenport. The town was incorporated by special charter in 1839, and the following year became Scott County seat. By 1840 there were some 600 people in the new community, most emigrants from Ohio, Pennsylvania and New York. Ten years later, the population had increased threefold, and included the first wave of German immigrants who soon dominated much of Davenport's commercial and social life. By 1860 Davenport's population stood at 11,267, and the once struggling village was well on the way to becoming a major city. Davenport's early growth was in large part a function of its location. In the city's first decades, the Mississippi was one of the nation's primary transportation routes. Davenport acquired its share of population, goods and merchandise moving west down the Ohio and north from New Orleans and St. Louis. In turn, as settlement in the Iowa interior increased, the city became a logical point from which farmers shipped produce back east. Looking to the future, however, Davenport businessmen, among them Antoine LeClaire, Hiram Price, James Grant and Ambrose Fulton began in the late 1840's to contribute money and time to railroad development: the Chicago, Rock Island Railroad from the east, and the Mississippi and Missouri Railroad west from Davenport to Council Bluffs. The lines were connected by the Mississippi River's first railroad bridge, completed in 1856. After the Civil War, railroads replaced the rivers as the principal arteries of transportation in the midwest. In Davenport, this development was reflected in the increasing number of rail lines, freight stations and other support structures, and in the gradual reorientation of the central business district, and particularly the hotels, away from the waterfront. With the exception of sawmill owners, for whom the river remained an important aspect of their business, most people in Davenport began to see the Mississippi primarily as a barrier to be crossed. The first railroad bridge was replaced in 1872 with a double deck "combined" bridge (for both rail and wagon traffic) and yet again in 1895, when the U.S. Army Corps of Engineers gave Ralph Modjeski his first major bridge commission. In 1900 the Davenport, Rock Island and Northwestern Railroad built the Crescent Bridge, subsequently acquired by the Chicago, Milwaukee and St. Paul, and the Chicago, Burlington and Quincy Railroads, bringing the latter line to the city for the first time. Located at the intersection of two major transportation routes, the river and the railroad, Davenport by 1860 was well positioned to achieve both commercial and industrial importance, and was given an additional boost by location of five military camps, including a POW camp on Rock Island, in the area during the Civil War. Access to the east made available a wide range of manufactured goods for both local and regional consumption, and at the same time the midwest's own products offered numerous possibilities for local industry. Martha H. Bowers, Dennett, Muessig & Associations, , nomination document, 1982, National Park Service, National Register of Historic Places, Washington, D.C.